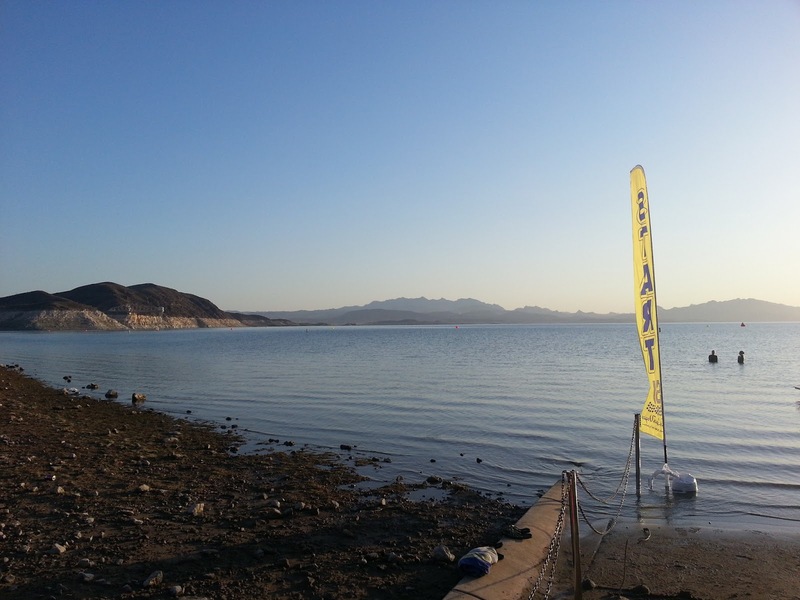 Beautiful Boulder Beach before the start of the LV10K. I am just now sitting down to my computer after a great weekend of swimming with friends in Las Vegas. 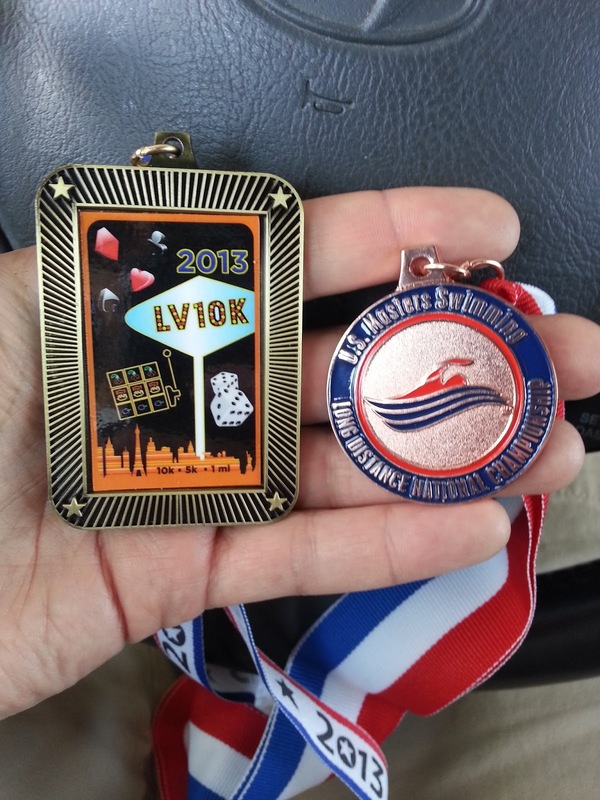 This past Saturday was the inaugural LV10K at Lake Mead. The race was also the USMS 10K National Championship. I figured this was probably one of the few chances I would get to swim in a national championship race (they move it around every year), plus I knew that Kara and Paul at Swim Las Vegas would do a great job putting it together, so I signed up early. I drove down Friday morning and went straight to the Boulder Beach campground to make sure that I would have a place to sleep that night (the campground is first come, first served). 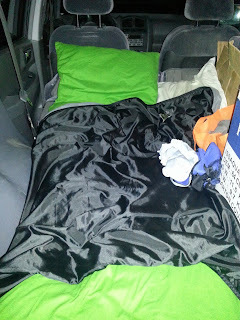 I got a camp site without any problems and then drove back to Henderson for packet pick-up. I think it was a good idea on the race directors part to have pick-up and body marking the night before, it made the morning of the race a lot less stressful. Body marking for the 10K was done with temporary tattoos, which I though was pretty cool. The swag was pretty sweet too: cool tech shirt, two caps (one silicone and one latex), and a bunch of gels. There were also free massages, which pretty much undid all the hours I had just spent driving in the car. After packet pick-up, I went to dinner with fellow Utah swimmers Gordon, Wes, Kelsey and Brandon. We had a lot of fun talking about swimming and other things and the food was pretty good. My not so comfy bed. After dinner, I made a stop at the grocery store to get a few last minute items and then drove back to Boulder Beach. Gordon and his son Jonas shared my campsite and they were already there with their tent set up when I got back. I put the seats down and slept in the back of my car. It was as uncomfortable as it sounds. I tossed and turned all night, not able to straighten out my legs. Saturday morning started early. The campers next to us were up at 5am and made enough noise that it woke me up. Since I was up, I took the time to apply a generous amount of sunscreen and organize my gear. After a while, Gordon and Jonas got up and we all headed to Boulder Beach. At the beach, I walked down to the water and waded in to my knees. It felt cool, but not too cold. The water temperature was something that I had been worrying about. 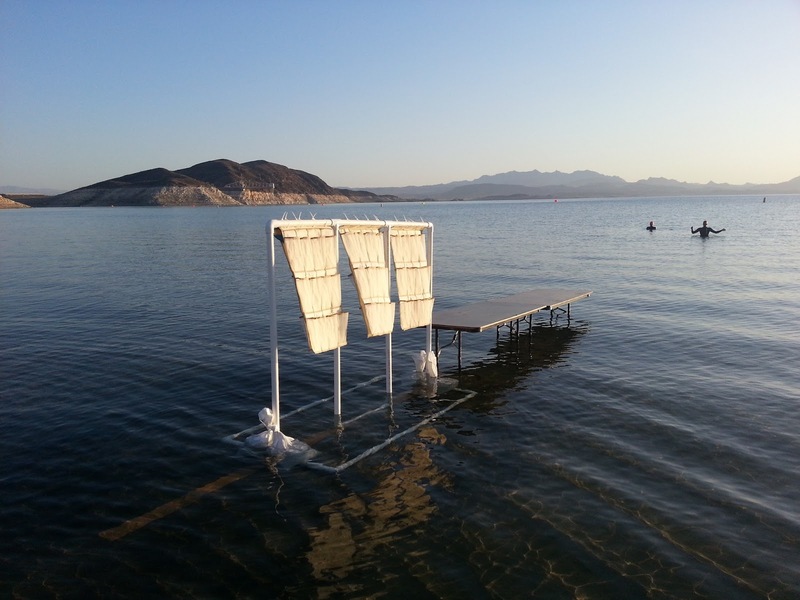 Just a week or so before, the reported water temp was 63 degrees. The actual race day temp was reported between 68 and 72 degrees. We had plenty of time before the swim started and I spent most of that time in the canopy Gordon had set up talking to Sue, Todd and Gordon. As it got closer to race time, I put on more sunscreen, got greased up and took my little "feed" cooler down to the feed station. At the last minute, I opted to use the cooler instead of the bottle rack after seeing the rack tip over. After a brief pre-race meeting, we all walked into the water for the start. Sue, Gordon, Miles and I were all grouped together. At the sound of the start, I dove in and started swimming. I could see Sue right at my side as we navigated the chaos of other swimmers. Last year I started singing "99 Bottles of Bear on the Wall" in my head while swimming. It works well for me to keep my pace and also gives me somewhat of an idea how long I have been swimming. The course was a "T" shape and we would swim four laps, passing the feed station near the shore each time. At the end of the first lap I was feeling good and chugged down some Perpetuem at the feed station. During the second lap, the old familiar pain in my right collar bone started showing up. Halfway through the second lap, it was hurting pretty bad and I though I might have to quit at 5K. At the end of the second lap I took a gel and more Perpetuem and convinced myself to do another lap. The pain was better on the third lap and I got into my groove. There were two other swimmers who were right with me the whole time. We kept passing each other and were pretty much even at the feed station. I took another feed of gel and Perpetuem before starting the fourth lap. At this point, I knew I would finish, even though the pain was starting to get bad again. At the last turn, I tried to pick it up and was at a near sprint when I finished. My goal was to finish under 3 hours and I ended up finishing at 2:52:48. In retrospect, I should have done my usual pre-race stretches and swam a little more in the week leading up to the race. I think that's why the pain in my collar started up and it kind of threw me off mentally during the swim. I was happy that Gordon and Sue both beat their goal times. 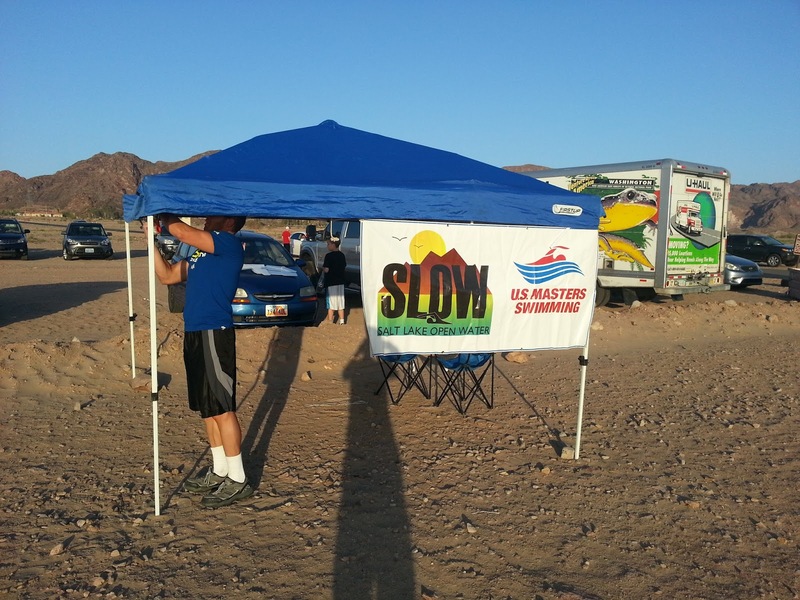 This was Sue and Miles' longest open water swim and they both did awesome! Wes, Brandon, Kelsey, Todd and all the other Utah swimmers all had great races. With the swim over, we are now going to put together 3 man SLOW relay team to enter. The relay event works by combining the individual times for each of the relay members. All relay swimmers must belong to the same club. Finisher medal and 6th place age group medal. The final results are here. There were some CRAZY fast swimmers at this event. Doing a 10K in 2:08 is unbelievable. Kara, Paul and everyone involved with the organization of the race did a fantastic job. I felt safe at all times and enjoyed swimming laps for a change. The post race cupcake and massage were awesome! Thank you to the organizers, volunteers and other swimmers for a great experience!